Last year we got snowed out, so we're all hoping the weather is more helpful this year. Today is the final stop of the blog tour for Footprints on the Ceiling. Dawn from Little Shack In the Boondocks hosts today's review. She and I go way back, as you'll see from her post. Good memories. She and her sister were such a blessing to my sister and me at a time when we didn't have friends our age at our little church in Minnesota. Huge thanks to all the bloggers who read the book with an especially careful eye and shared their insights with you. And thanks to all the readers who came along for the ride. Mrs. Smucker's 7 Amazing Life Hacks!! "What are you reading, Mom?" one of the kids asked, walking by as I avidly read something online. I decided to tell the truth. "I am reading a list called, 'The 40 Greatest Love Stories Ever.'" I said, "There's Antony and Cleopatra, Elizabeth Bennet and Mr. Darcy, Romeo and Juliet..."
This didn't make it sound any more mature. This is my great weakness: Lists. With numbers. And little testimonials. If someone on Facebook links to an article called, "How Christian Wives Sometimes Discourage Their Husbands," I might or might not click on it. But if the link says, "7 Things You Do That Make Your Husband Feel Like Marriage Isn't Worth It--I had no idea I was doing # 5--weeping and repenting right now!" I cannot resist. It pulls me in, my finger moves, click and scroll, read read read. "25 AMAZING Recipes for Using Up Wrinkly Golden Delicious Apples!" 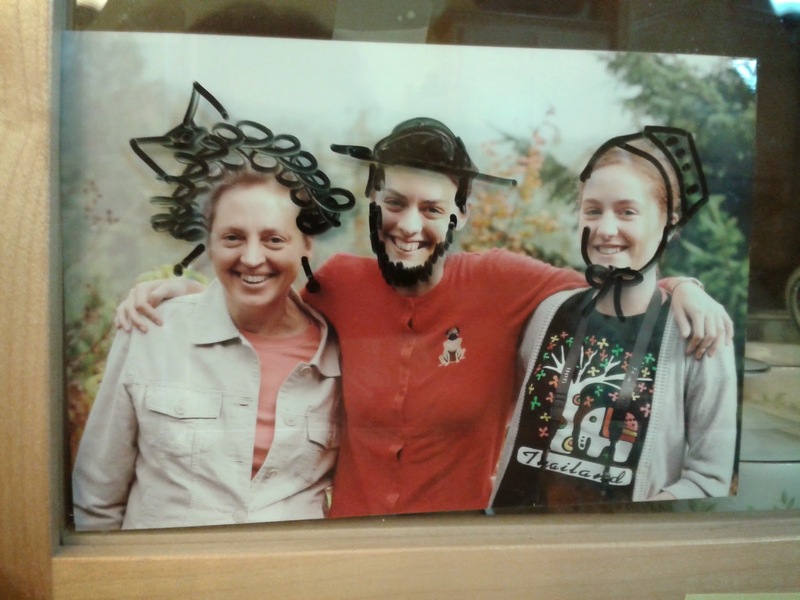 "You Won't BELIEVE These 8 Rules In A Mennonite School In Oregon!" "5 Beautiful Houses That Used To Be Grass Seed Bins--MIND BLOWN!!" I got to wondering--what is is about numbers? Take a look. BuzzFeed, blogs, articles and feeds of all kinds--it's all about lists and numbers and bullet points. "17 Dads Who Totally Won 2014"
"35 Photos That Prove Your Entire Life Is A Lie"
Those two are actual links on BuzzFeed. I also got to wondering: would I boost my numbers if I mixed some of these appealing attributes into one blog post? "7 Amazing Cures For SAD From Everyday Ingredients In Your Purse--# 4 blew me away!!" "The 5 Best Phrases To Calm An Upset Teenager--My shrieking daughter was smiling by #2 and hugging me by #4!!" "12 Simple Ways to Get a Farmer to Share His Emotions! !--I tried #8 on my dad--you won't believe what happened!" Emily thought I could do a post on Life Hacks, a term I'd never heard until a couple of years ago. A life hack seems to be a cool new way to use a normal object around the house to solve a problem. She said I have lots of clever solutions around the house that other people might never have thought of. 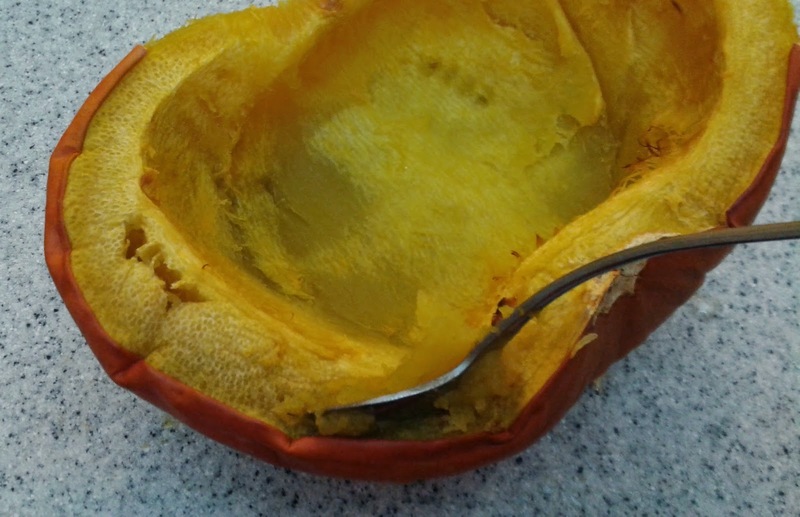 The next day, in preparation for Thanksgiving and pie, I cut two pumpkins in half and baked them in the oven. Then I began the arduous task of scooping the good stuff out of that floppy shell. 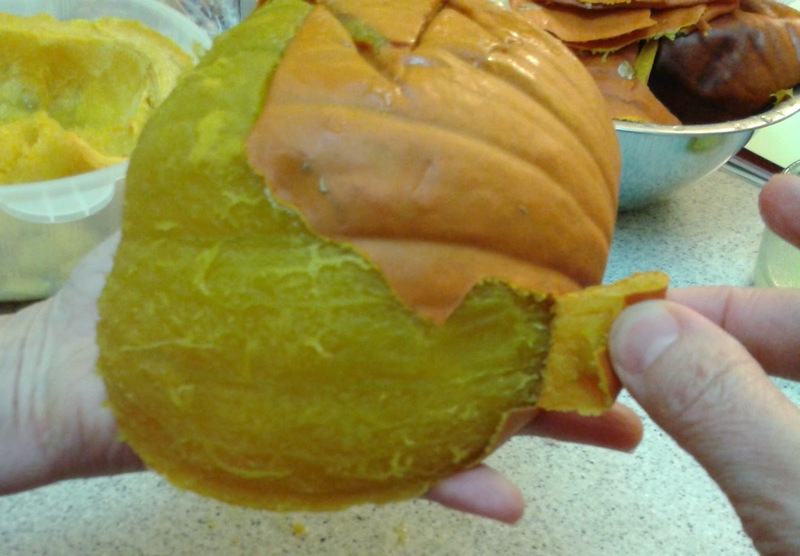 I flipped the pumpkin hemisphere over and peeled off the shell, just like that. I said, "Hey, I should post this! On a Life Hacks list!!" Emily said, "Surely lots of people already know to do that." Humph. I'll bet they don't. So that's #1 on my list, and if you've been doing that for years, I don't need to know. 2. 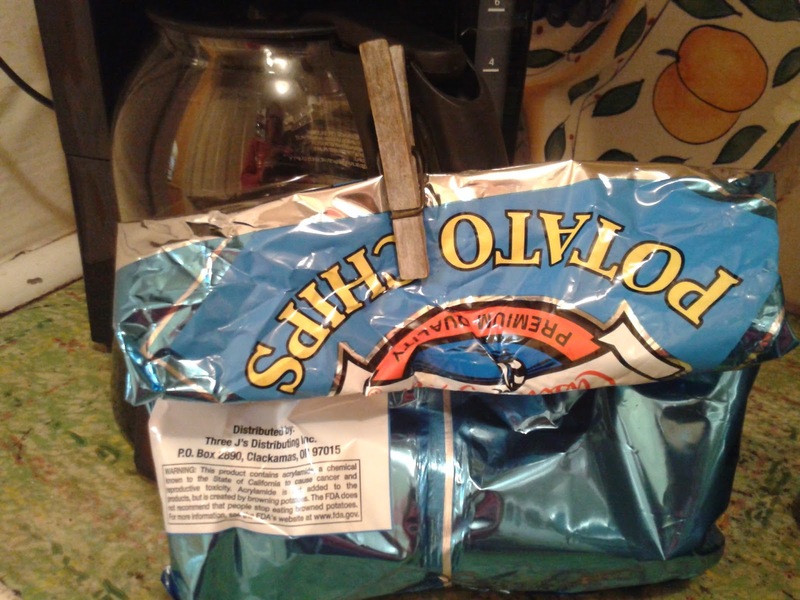 Use clothespins to seal chip bags. I thought everyone did this, but Emily said they don't. 3. 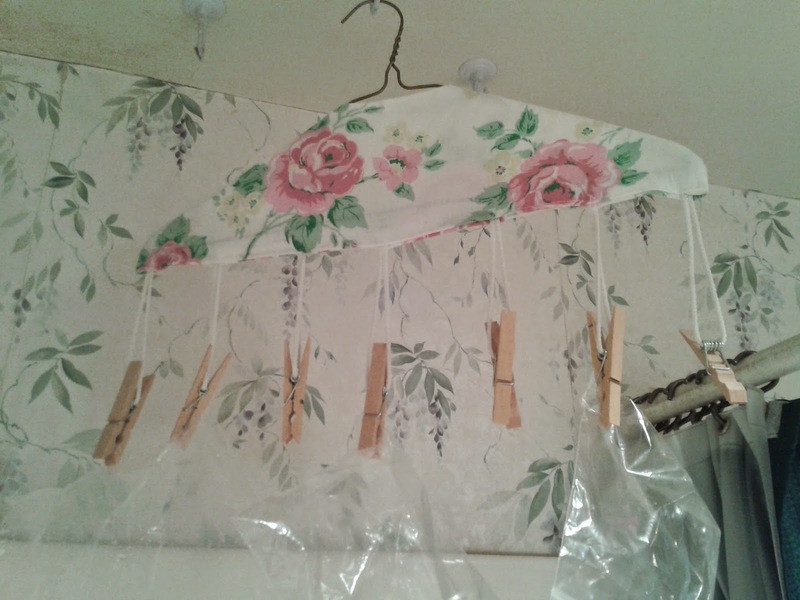 Hang a hanger with clothespins on a hook above the bathtub. Wash and dry and re-use plastic bags. This is the sort of thing that also shows up on lists like, "8 Things Every Minnesota Grandma Does--I'll bet yours does #4." 4. Make your own hanger with clothespins. 5. 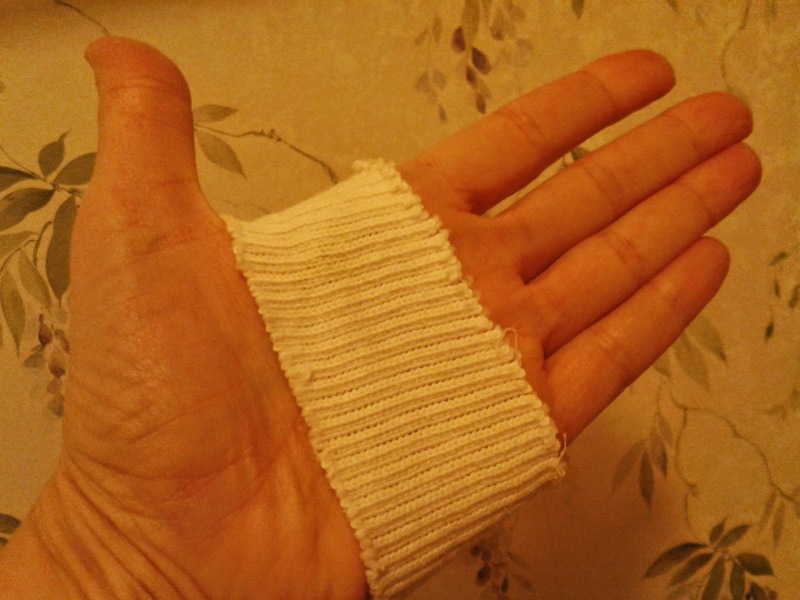 Cut the cuffs off old (clean) athletic socks to bandage awkward shapes. 6. Cool cookies on layers of old newspaper. 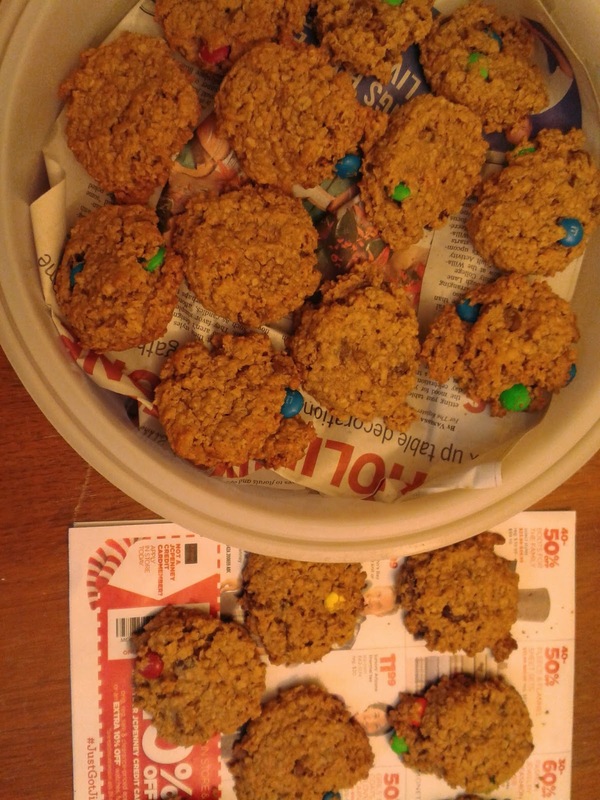 Then use the newspaper between cookie layers in your Tupperware. 7. 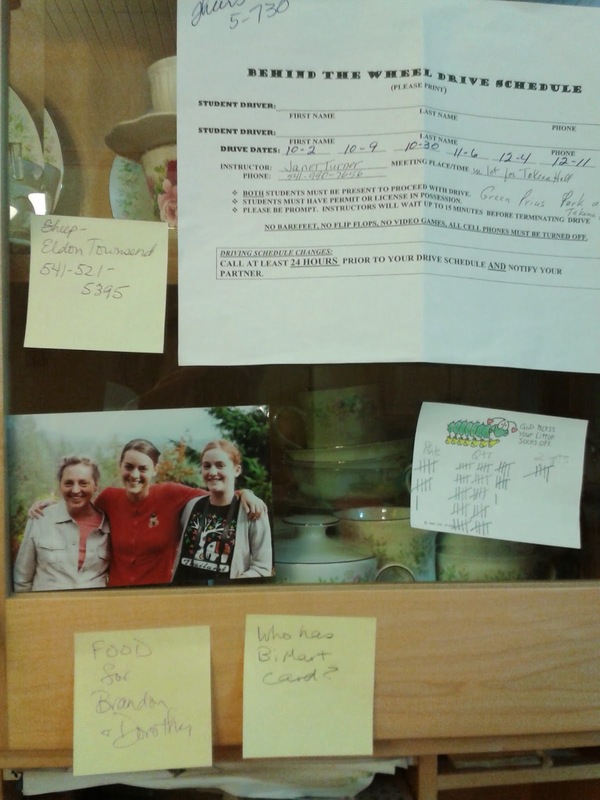 Use cupboard doors and Scotch tape and Post-Its if you don't have a bulletin board in the kitchen. If you tape pictures on the inside of glass doors, you can have fun with markers. "Sadly, despite her husband working three jobs, and her own success as an author, Dorcas still couldn't afford to replace the broken laundry baskets." Today's blog tour post is from Crystal Kupper in England. Be sure to click on the link to her story of re-creating her grandparents' wedding photos. Tomorrow is the last stop on the tour! Anita is the author of Life is for Living. She lives in Poland and blogs at Tis a Gift to Receive. Today she reviews Footprints and does a double giveaway. Read her blog for a new perspective on life, beauty, relationships. Today we stop in at Mary Ann Kinsinger's pretty blog, A Joyful Chaos, for a review and giveaway. As you can see on the sidebar, Mary Ann is co-author of a number of children's books. You might want to check them out. And Footprints is now available on Kindle. I feel like I've been traveling all over on this blog tour, and this week I hop up to Canada and also across the pond to Poland and England. Feel free to come along. And yes, there's a giveaway at each stop. Today we go to QuintuplicateMom in British Columbia. This is the schedule for the week. Thank you to each of these bloggers and everyone who came along for the ride. Gina over at Home Joys is reviewing Footprints today, doing a giveaway, and asking how you and your husband met! Keri Lewis has a lovely blog called Keri Recommends. I'm happy to have Footprints on the Ceiling featured today. And yes, you can sign up for a giveaway. Today the nephew's wife's sister and her husband are laying their 5-year-old daughter to rest. She died suddenly of pneumonia. There are no words for this level of sadness and loss. All of us with daughters who are now or were once laughing, vivacious, creative, adorable 5-year-olds are feeling the magnitude of this, the heaviness, the emptiness. And yet, it was them and not us, and this is their terrible journey to walk, and not ours. I hope they have people who will sit with them and just let them hurt for a long time to come. I've always felt handicapped by an ability to see both sides of an issue. Other people always seem so sure of themselves. OF COURSE gun control is a good idea. Contrast the murder rate in the U.S. vs Canada! Why would anyone need guns, especially a cabinet full, and especially assault rifles? Seriously. Or: Gun control is a TERRIBLE idea. If you're going to live in the country and deal with nutria and all kinds of other pests, you need a gun for economic reasons. And what about the cougar prowling around your friend's field, endangering all the kids in the neighborhood? And what about all the responsible, careful people who enjoy hunting and target shooting as a sport? Seriously. On this issue and many others, few people seem to be somewhere in the middle, and ones I know and love are convinced they're utterly and completely right, and they're firm and solid in what they believe. Meanwhile, I understand both sides equally well so can't take a stand either way, which in some cases is a good way to go crazy. It's the same way with Christian/church/Biblical things. God's sovereignty vs. man's free will, for instance, also known as Calvinism vs. Arminianism. If you run in Christian circles, you've talked with people on each side of this who would die for their view and who have a neat and tidy explanation for all the verses that give some weight to the other. Naturally, I can understand each side all too well, which always made me feel like an immature Christian who couldn't make up her mind. We had a speaker at church recently (Ernest Witmer from California) who had a perspective I've never heard before. He said that we have very Western mindsets in that we are big on logic, a systematic progression of ideas, and tidy answers. If A=B and B=C, then A=C. That makes us happy. We are good at geometry. The Hebrew mindset was different, he said. They were all about balancing and even embracing two opposing truths at the same time. The resulting tension was not something to be avoided--it was actually intentional. So, he said, the seeming contradiction of so many truths in Scripture is intentional. God's judgment vs. his mercy and love. It's not either-or. They're both true. God's sovereignty and man's free will can both be true, however improbable, and we find meaning in striving for the balance between. We don't have to choose one or the other to be a mature Christian. It's ok to believe that both can somehow be true, but not to understand quite how. Parenting is all about that tension between love/acceptance/affection and discipline/toughness/boundaries. Church life--hugs and warmth and welcoming sinners while also challenging people to holiness and discipleship. Finding a balance is never easy, but it helps if you think of the tension as having a purpose in and of itself. The other day I overheard a woman say, " 'Sadie Gingerich'* is my favorite blogger!" And I felt an immediate stab of--yes--jealousy. Thankfully I had the good sense to quickly take it to the Lord instead of mulling over it. "Ok, God. I am jealous. What do I do with this?" An immediate reply: "If you're No. 1, you have to maintain that position. Do you really want that pressure?" I thought: No. Shudder. I most certainly do not need or want that sort of pressure. The Oregon Ducks are hovering toward the top of the rankings recently, which you already know if you follow football, and today they're number 2 in the CFP rankings, the newspaper says. There's an intense pressure at the top, it seems, and especially at No. 1. It's hard to maintain your footing there. Everyone is trying to take over your spot. But even knowing that, it's hard to want someone else to do better than you. Jealousy goes with the territory, author Deborah Raney said at a writers' conference I attended this year. You have to deal with it coming and going, both with your jealousy of others and others' jealousy of you. I've certainly been on both sides of this. Writers live and die by numbers. Book sales, blog hits, fan letters. But asking flat-out is like asking someone how much they weigh. So we listen hard and do math in our heads. "I lost 6000 readers a month when I had the baby and wasn't blogging much," a fellow blogger says, and you can just about hear the abacuses clicking in our heads as we wonder, well, was that 25% of her readers? And if so, she was getting, what, 800 hits a day?!! Unreal. Not fair. It's all because of those cute pictures of her kids. And then you say that you decided to order 3000 copies of your new book, and non-writers say, "Hmmm. Cool," and other writers squint a bit and you can just about hear the whir and see the paper spooling out of the adding machine. Deborah talked about being invited to a publisher's conference and having reason to believe that she was one of the featured authors. So she arrived, all excited and full of herself, and there were other authors' photos on the flyers, the billboards, and even on the sides of buses going around town. And not hers. She was headed back to her hotel room to spend some time crying and feeling sorry for herself when she happened to be in the elevator with a ten-year-old boy. Who was blind. And who was so happy to learn how to push the right elevator button. But back to having favorites. I went off about this last night to one of my patient daughters. "Why do you have to announce who your favorite anything is?" I said. "In fact, why do you have to have a favorite at all? And shouldn't you have the decency to look around and see who might overhear--either in real life or online or anywhere else--before you just say it and hurt someone's feelings?" The patient daughter disagreed. "No. That's being way too sensitive, and it's asking way too much of people. You seriously expect them to think, Ok, who else might see this and get jealous, before they say who they like best?" Well, yes, maybe. At the very least when you're right there. I can't tell you how many times people have come up to me at an authors' event and said, "Ooooh, you and Bob Welch are my two favorite columnists in the Guard, but I have to say I like Bob just a wee bit better." And I think, "No. You do not have to say it, actually. I can live just fine not knowing that." Then there were the times my fine husband was right beside another minister and someone came up to Paul and raved about his amazing sermons, implying if not actually saying that he was their favorite. And Paul thought, "No. Please. Don't do that." I liked what Joanna Hendricks said in her book review this week, not only the nice words about Footprints but also the thoughts about having favorites. As I was reading Footprints on the Ceiling, enjoying, musing and plotting my review, I kept thinking, "This is my favorite chapter...no, wait! This one is... Oh, just a minute, definitely this one..!" In other words, the whole book is great and I never really did decide! I believe this is okay, for life condensed down to only one favorite is a bit boring and overly-simplified, you might say! In a world of great chocolates, need I select just one? In a world of great hymns, who would want to sing the same one over and over again? In a world of great people. why have only one friend? In a book full of great essays, why pick only one favorite when, one after the other, they make a real treat to savor as one would a delicacy chosen from behind the glass at a specialty bakery. So. It's ok if you like Bob Welch or Sadie Gingerich better than me, really. I like them better than me, too. Just don't share that little piece of information with me--is that asking too much? Shari Zook blogs over at Confessions. Stop by for today's interview, review, and giveaway, and then stay around for her other posts. She's always interesting, amusing, thoughtful, and just a bit mysterious. Joanna Hendricks at What's In My Teapot? has a book review and giveaway today, and also a free sample chapter. Pour a cup of tea and enjoy. We took a break today, since we all need a Sunday off, then tomorrow the blog tour starts up again. Tuesday, November18--Joanna Hendricks at What's in My Teapot? Today was one of those Sundays that was not restful and involved all of us spidering in all directions and of course the resulting complicated figurage of rides. We had a missions committee meeting after church, so we 3 families on the committee brought lunch to church and shared it. Then Ben was in on the meeting, Steven wanted to go to a concert in I think Portland, Jenny needed to meet someone in Albany at 2, and Emily wanted to go home. So Emily took off in the family car, not knowing there was a crucial bag in the back seat that Jenny needed. Emily didn't answer her phone, which is normal and wise when she's driving, but maybe she could make one exception. So I hollered at Steven to "chase her down," a command that I later realized wasn't the smartest to give to Steven because he would do it, happily and literally. The trouble is that Emily is like me and tends to concentrate on her driving and not what's going on around her, so even though Steven passed her and honked his horn, she just kept driving. And frowning at the road, said Jenny, who was getting frantic. Somehow it all turned out ok. I took a Waldorf salad to the lunch today. Do other people do this? I spent a good portion of my life deliberately not doing stuff because my mom did or liked it. For example, in high school I never touched the Anne of Green Gables books because Mom thought they were so good. And certain foods, such as carrot salad--consisting of grated carrots in orange jello, which Mom always made for Sunday dinner company--I never made specifically because if Mom had made it, it was naturally provincial and old-fashioned and certainly not cool. At some point the compass turned and I started reading and doing and making things specifically because it's what Mom did. I love Anne of Green Gables. The other day in a second-hand store I tried on a pair of shoes for the sole* reason that they were just like Mom would have worn. And today I made Waldorf salad because I had apples to use up and Mom used to make it. Speaking of coordinating rides, I am trying to get the family together for Christmas. Four of them live at home, one is coming home from Thailand for a long vacation, so it shouldn't be that hard, right? Well. It is. There is a sweet young girlfriend in the mix who must be visited, which I don't begrudge and am in fact encouraging, and a Navy project that won't be finished until the 23rd, and I have taught the engineer to be responsible, have I not? But why does it all have to interfere with my precious plans for the family get-together?? Then of course the air fares are up in the jet stream for weeks except on Christmas Day. Someone thought maybe this son could come and that one could go, all on Christmas Day. I said absolutely not. I am turning into a crazy woman, wild-eyed and shrieking: "WE ARE GOING TO BE A NORMAL HAPPY FAMILY FOR ONCE AND WE ARE GOING TO HAVE CHRISTMAS ALL TOGETHER AND HAVE A FAMILY PICTURE TAKEN IF IT'S THE LAST THING WE DO AND YOU ARE GOING TO BE COOPERATIVE ABOUT IT!!!" I am obsessing about taking that family picture together. And about three perfect family days at a house at the coast. You know how this will go, right? So do I. It has been cold and rainy and then cold and dry. You never met cold and nasty and wet until you've lived in Oregon. We decided to take in an activity at the U of O the other night, where Emily attends, just Emily and Jenny and me having a happy Mother-Daughter Girl Night of Bonhomie and Making Memories [notice a theme developing here?]. It was about 35 degrees and pouring rain. The drains were all overwhelmed so there were deep ponds at all the crosswalks. Emily decided to be all scientific and smart with a plastic bag she found in the back seat of the car. She pulled it over her one boot and figured she would step into the crosswalks first with that foot, since most of the lakes were small enough that you would only get one foot really wet, and the second step would get you close to the other shore. So we went blazing off into the night, a trio of hunched shoulders and scarves and gloves and hooded winter coats. Jenny leapt gracefully over most of the first puddle. Emily followed, into the huge puddle, according to plan, then out the other side. And as I gritted my teeth and splashed my foot into the icy deep, I noticed a plastic bag, floating calmly by. A puddle and several wet sidewalks later, Emily yelled, "Hey! What happened to my bag??" We didn't get home til almost midnight. We all had wet feet and wet coats and were very happy to get into warm beds. I was worried we'd all get pneumonia. Meanwhile our three--yes, three--new kitties are inside until it warms up just a bit. First, Steven found a stray black kitty at the warehouse so of course he rescued it. And named it Raven. Then Tim and Rebekah from church are getting ready to go to Africa so wanted to place their kittens in homes of people they knew. The girls each wanted one so the very fluffy JulieSara and EllieAnne arrived about the same time as Raven. They sit under the kitchen chairs and hiss at him. Raven likes to lurk behind a chair leg and then swipe the others as they go by. They remind me of Paul's students at school. "i am downsizing. i have normal stuff. Normal stuff. Anything you want make an offer. If i dont want to sell it it will either be out of site or i will say no. Browse shopping. This is serious. I dont have time to set up a g sale. Buy everything i have for sale for $1200. Except.for the huge whirlpool side x siide frig. $300 firm on that. Cmon by." Today we go to an artistic young woman named Gabrielle who is not only reviewing Footprints and doing a giveaway, but also asking for advice about life! Head over to the lovable Mary Ann's blog today for a book review and giveaway. I like reading the comics. Granted, I don't follow LuAnn's shallow teenaged dilemmas all that closely, and I long ago got tired of Rex Morgan taking days and days' worth of comics to move the story along a few inches, but I love how so many other comics reflect life so accurately. Plus I like stories with pictures. If you are from the generation of Christians that thought comics were evil, and who ripped up the comic page before it ever came in the front door, I would prefer not to offend, so maybe you'll be happier if you move along now. Last Sunday I started reading the comics--all oversized and colorful like they are on Sundays--and I laughed and laughed. They all seemed to be just like us. I'll share a few of them. What is it with children, work, and excuses? I'm sure I was just like this, and so were most of my children. And I am not condoning cussing, or substitutes thereof, but this also reminds me of how Matt, when he was young and upset, would holler, "Saturn, star, asterisk, mosquito coil, exclamation mark!" This one also reminded me of Matt, and all the animals he collected and wanted to collect. Among them, oddly enough, was that exact species: a Madagascar hissing cockroach. You can read that story in Ordinary Days. 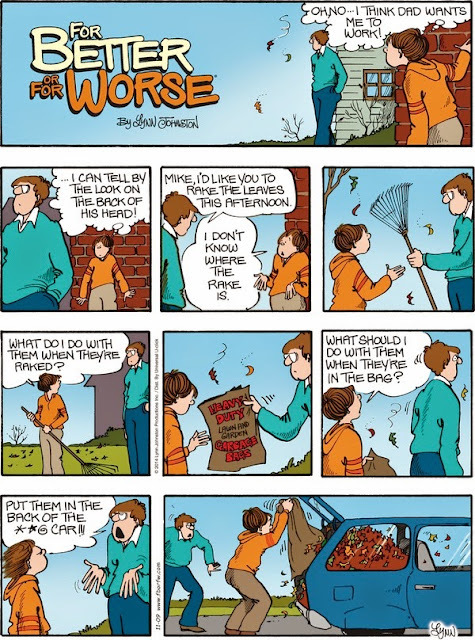 I also know the author of Stone Soup which makes me extra fond of the strip. 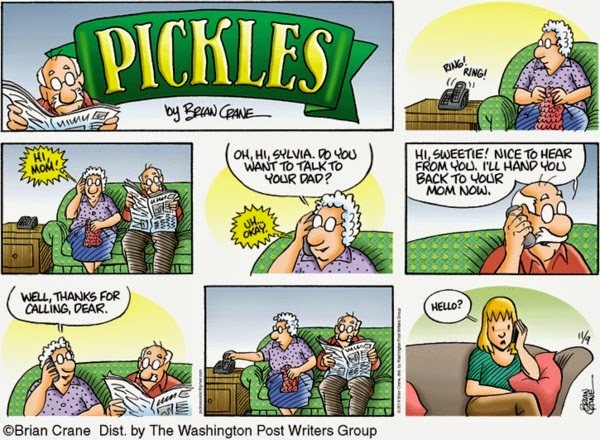 Pickles made me laugh because back when Mom and Dad were still in their house and could sort of communicate on the phone, calls home were exactly like this. [Except Dad never called me Sweetie of course.] That generation never learned to chat about nothing on the phone--or that's my theory. And I wasn't that terribly amused by Zits, but Ben read it and howled and laughed long and loud. "It's like Steven!!" he gasped. "And his attempt at a moustache! Ha ha ha ha ha HAAAAHHHH!!" For some reason, Steven was not amused. Me: I hope you guys listen to the Holy Spirit better than you listen to me! Ben: Yeah, well, the Holy Spirit doesn't tell you to take out the trash and right after that to empty the dishwasher and right after that to put the cat out, so you put the cat out and forget to take out the trash. I'd like to thank Bethany Eicher, because she asked me to do a how-we-met guest post last May. That led to the title of my new book, and the post became the introductory chapter. Bethany is reviewing the book on her blog tour today. Head over to About My Father's Business. You just might win a free copy. The blog tour for Footprints on the Ceiling has begun. I have 17 willing bloggers on board and each one will do a giveaway of one copy of Footprints, so the more you visit and comment, the better your chances of winning a free book. 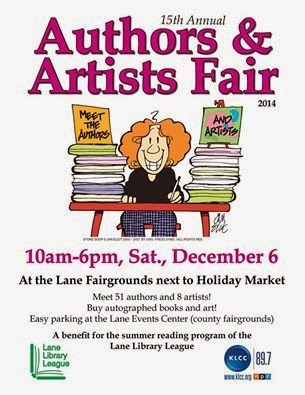 Monday--Donna McFarland blogs at Duck and Friends and did a very nice review today. She is a mom, author, music teacher, and fun person to sit beside at book events. Tuesday--Jenny Smucker. Yes, my daughter, who loves me and likes my books even though I write about her and her oozing cookies and messed up muffins. She blogs at Dreaming of Dragonflies. Wednesday--Christine Weaver blogs at Shall Run and Not be Weary. I don't think we've met, but she seems like a lot of fun and her big family--some of whom are adopted--always seems so lively and fun as well. Thanks for your interest and I'm sure you'll enjoy these blogs. I almost gave up on the camellia bush. As one of those determined, low­-maintenance plants that makes people like me look like far better gardeners than we are, the camellia bush filled my office window with a view of sturdy branches and thick, shiny leaves. As I recall, the leaves never dropped off in all the 14 years we’ve lived here, even as the plant grew some 12 feet tall. It bloomed in an explosion of pink early every spring. It reassured me that if, God forbid, our daughter Jenny or any other child fell from the upstairs window, they would land safely in those dense branches instead of on the ground. Independent, reliable, pretty and multipurpose — that was the sort of bush I wanted for a friend. Last December we had a cold snap, the temperature dropping into unheard-of frigidity — single digits, then zero, then seven below. Well into January, with the weather back to normal, I noticed that the camellia leaves were dropping off the bush, making a thick layer of dull leaves with curled-up sides, shrunken and sad. Surely this was a normal response to extreme cold, I thought, Nature taking care of her own, and the bush would revive and bloom in February like always. I saw one bud in February. It snapped off when I touched it, a dead relic of the previous spring. The bare branches scratched my window through March and April and May. Was it dead, or not? Brittle twigs broke off in my fingers. The only green on the entire bush was a bit of moss. A dark eyesore on the north side of the house, stark and naked among all the greenery and growth around it. But I had a horror of cutting it down if there was any chance it would revive. So I waited. Meanwhile, daffodils and tulips bloomed, and lilacs and fuchsias and daisies. Surely it was dead and ruined, and we might as well cut it down, burn it, replace it with a new shrub. But I still had an inner urge: wait. I think it was August when I saw the most improbable sight. All around the thickest part of the trunks and up into a few limbs, stiff green leaves were pushing out, point first, through solid wood. They kept growing, emerging whole and fresh, followed by stems and still more leaves. It was soon obvious that every branch over an inch thick had survived, so I whacked off everything smaller. Then I watched it through the office window, an increasing green, a growing population of leaves. I was so glad I had waited. Looking up from the computer at the camellia bush’s progress, I would think of other dilemmas, most of them far more significant than shrubbery, and this recurring decision. Do I give up or keep hoping? Am I waiting on something impossible? When does hanging on become ridiculous? When is a situation all rattly branches that will never bloom again? How long do I wait to find out? Is it time to saw that difficult relationship off at the roots? Should I ask the failing student to drop the class? Is the troubled young person a lost cause? Will I ever influence this organization? Will that person ever understand? And, less weighty but still of import: Should I give the maddening smartphone to one of the children, give up on technology and go back to being Amish? The smartphone was a hand-me-down from our oldest son, Matt, who is an engineer for the Navy and relentlessly optimistic about my tech-learning capabilities. He has coaxed and coached me through cutting and pasting paragraphs, opening new windows online, backing up documents, signing up for Facebook, and a hundred other screeny skills I never dreamt I was capable of grasping. And countless times, when I was in complete despair, he calmly told me to turn the computer off and back on again, and then everything turned out all right. Despite Matt’s optimism, I’m almost ready to give up on the smartphone. How can such a nifty device take five separate steps to call my husband, when my old flip-phone took only two, with only one hand, and I didn’t even have to look — that’s what I wonder. Matt, as always, believes in me. “Just keep using it,” he says, cheerful and confident. It’s an interesting message from a son who once seemed hopeless. A mom is never supposed to give up on her children, but I remember a dark stage when I was sure that my relationship with Matt was doomed to disaster and so was his life. He was 13, angry and irritable, fighting me on every front. I was, I realize now, far too obsessive and picky. We were constantly in conflict. Our lowest moment was when Matt and his dad left for a weeklong trip, and Matt refused to hug me goodbye. I was sure he had been born to the wrong mom, I was a failure, and all my hopes were frozen leaves dropping in a wilted pile. How could I have seen, back then, the green shoots pushing impossibly from a black bough just a few short years later? I remember a Christmas party when Matt was a junior in high school. He came up behind me and tilted my chair back to scare me, and we laughed together, a moment of healing and success and hope restored. Matt was my guinea pig, I tell him now, and his five siblings benefited from everything I learned at his expense. He forgives me, he says, and adds, “I was a tough kid to raise.” Then he shows me how to back up my email account. It’s OK to give up on the zucchini recipe that won’t work for this family and the hot-glue-and-coffee-filter project that will never resemble the Pinterest original. It might even be healthy to give the smartphone to an eager teenager and go back to a flip phone and a good pen. But with people — family, students, friends, and the many who circle into my life for a season — I sense an inner urge to wait. Give them time, don’t give up yet, keep hoping. We see only bare and black and hear the breaking snap of twigs, but there may be fresh green leaves about to push triumphantly from hard dead wood. Footprints on the Ceiling is now on Amazon. Special thanks if you leave a review. 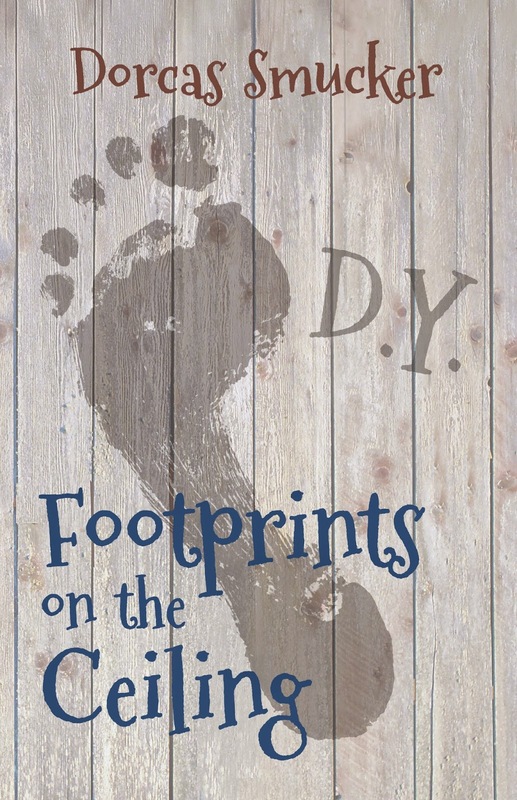 The blog tour of Footprints on the Ceiling starts Monday, November 10th. There will be a book giveaway with each post. I have been teaching the junior Sunday school class, a squirrelly bunch of 10-year-olds who talk a lot more than I did at their age, I think, but I am not going to contact my dad to verify this. We have been wading through lots of Old Testament kings going off to battle. There is much of the Old Testament that I don't understand, and much more that is difficult to relate to ten-year-olds. The most practical application --we Mennonites love the term 'practical application'-- seems to be about how to face big obstacles and fear. One Sunday I said, "Ok, we're going to go around the circle, and first I want you to tell me something you're thankful for, and then we'll go around and you tell me something you're afraid of." One boy piped up, "For me it's the same thing! My dad!" I decided that was not necessarily a bad thing, considering. Another child, asked to say what she's afraid of, exclaimed, "Satan and the dark and spiders!" I thought, yes. That about covers it. Spiders seem to be a recurring theme, in addition to Old Testament kings. I'm surprised how many of them, boys and girls alike, are seriously afraid of spiders but not of snakes. I am the opposite, and despite my fears of tall grass, I think I have it easier than they do. Snakes do not make nests in the ceiling light fixtures, at least not here in Oregon. Jehoshaphat sent people into battle with a choir singing praises. There's something powerful about that. Try it next time you encounter a spider, I told the kids. Or the dark. The enemy armies were going to be coming up the gorge at the Cliff of Ziz, Second Chronicles says, and I think that is the most wonderfully Dr. Seussian phrase in the Bible. Last Sunday I reseated everyone to try to cut down on the talking. Boy-girl-boy-girl, despite the protests, and one boy exclaimed, "You're the preacher's wife! You're supposed to be nice!" I laughed and laughed, but I intend to keep on being mean. So, ever since the Bible became a slick and marketed item sometime in the 90s, there's been a special Bible for every slice of humanity. "The Medical Worker's Bible." "The Women's Devotional Bible." "The Farmer's Bible." "The Safeway Grocery Sacker's Bible." You get the picture. I have written before about the strange mail you get when your husband is the school principal. On Sunday, this was in our box at church. I thought that was very odd, in addition to taking the specific-audience Bible marketing much too far. I opened the envelope. Then I rolled my eyes and exhaled in a long OhForeverMoreYou'veGotToBeKidding, like I do when I finally get Emily's terrible puns. 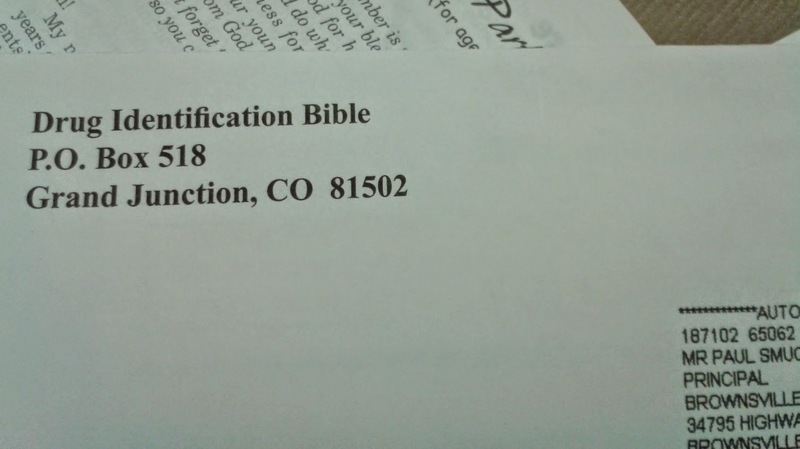 It uses the term "Bible" in the sense of "a publication that is preeminent especially in authoritativeness or wide readership"--Merriam-Webster online. It offers descriptions and pictures of thousands of drugs so Paul as principal can identify what he finds in backpack pockets, I guess. Praise God this is not something he's had to deal with, so far. Today I spoke to the Junction City Garden Club, a group of 44 women, many of them in their 80s, who take on ambitious beautifying projects such as planting daffodils all along the railroad tracks. I usually put this demographic to sleep, especially if I don't have a microphone, but they were engaged and awake and were actually able to hear me and asked lots of questions. So I had lots of fun. I suggested they take on Bruce Witmer's unfinished project of planting daffodils all the way from Harrisburg to Halsey, but somehow they weren't leaping out of their seats to volunteer for this. Last week my friends Bonnie and Rita showed up with an overloaded "Thirty-One" tote bag full of groceries, cards, gift cards, and other gifts, all from the church, for Pastor Appreciation Month. It was unbelievable. In fact, digging reverently through it, I repeated the word Un.Be.Liev.A.Ble about 25 times. I also cried because it was just so amazing. Your pastor and his wife would be greatly encouraged if you did the same, just so you know. Matt is growing potatoes in a plastic tote in his new apartment in Washington, DC. This makes me happy. My college kids, Ben and Emily, keep finding errors in their professors' work. Ben's teacher wrote a quiz question about a situation that is physically impossible, involving two balls on pulleys in water with a layer of oil on top, and the density of the one ball was supposed to be.....well, that's all I remember, but Ben says it can't work because the pulley can only apply pressure up, not down, and the pressure of the ball would keep it half in and half out of the water. Or something. Emily's grammar teacher says that "Dani was the girl who was chased by the dog," is incorrect, and "who" should be "whom." Emily feels this is incorrect. Other examples have much more blatantly violated everything Emily was taught in high school. Neither Ben nor Emily feels free to express their concerns to the instructors. I am being a good mom and letting them figure it out. "If I make coffee, it wakes you up. If Mom makes coffee, you have to wake it up before you can drink it."